The Internet of Things, automation, Big Data, robots, artificial intelligence, and virtual reality are becoming part of the civil aviation ecosystem, along with integrated data collection and better real-time communication channels. To make the most of these technologies, airports need to put in place processes that simplify and speed up collaboration with the aviation community at large. What major airline disruption can you think of? Smart Airports are coming, including Smart Security. I like what Delta is doing, later this year Delta will roll out facial recognition at its terminal at Atlanta International Airport for anyone traveling on an international flight, in replacement of a boarding pass. 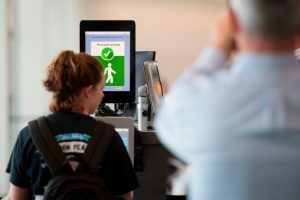 The airline said the biometric facial scanning is optional — a move that will shave off a few minutes off each flight — but will help border and pre-flight security authorities before jetting out of the US. 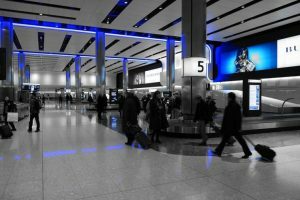 It’s the latest roll-out of facial recognition trials at Detroit Metropolitan and New York John F. Kennedy airports. Other airlines will likely follow and evolve with customer feedback and feelings about privacy but kudos to the next wave of automation and IoT in travel and giving us a peek into the next wave of efficiency! The intelligent airport of tomorrow is more than a vision, it’s a must. Restaurant experiences will become more dynamic as ques for lines become a thing of the past and are replaced with IoT beacons, kiosks to avoid lines and even food delivery to anywhere in the airport with the touch of a mobile app. To deliver this elevated fast casual dining experience, airports will need to implement on-demand digital technology and IoT scale interoperability to accelerate ordering and food preparation. Airports will need to continue to fine tune their experiences to successfully respond to these trends, as evidenced by the constant line at the Shake Shack at New York’s JFK International Airport. Reflecting on these trends, airports represent distinct IoT opportunities for embracing forward thinking development trends as a platform for Innovation and development to facilitate next generation concepts affecting how we live, work, play and move around. Making the right connections. Enabling better connectivity between people, processes and “things” will make airports smarter and more efficient.